I’ve been feeling pretty bad the past few days. Just run down, tired. My bones hurt. But, the past few weeks I’ve been going on shorter, “sprint” rides, where the whole goal is going fast and pushing hard. Anyway, instead of riding Wednesday afternoon, as I often do, I rode Wednesday morning instead. And, once again, I didn’t take a break. So, no meditative moment of introspection. But when I came home and had a shower, I then lit some incense and candles and meditated/journaled here at my writing desk for a while. Amazing how much better I feel already. 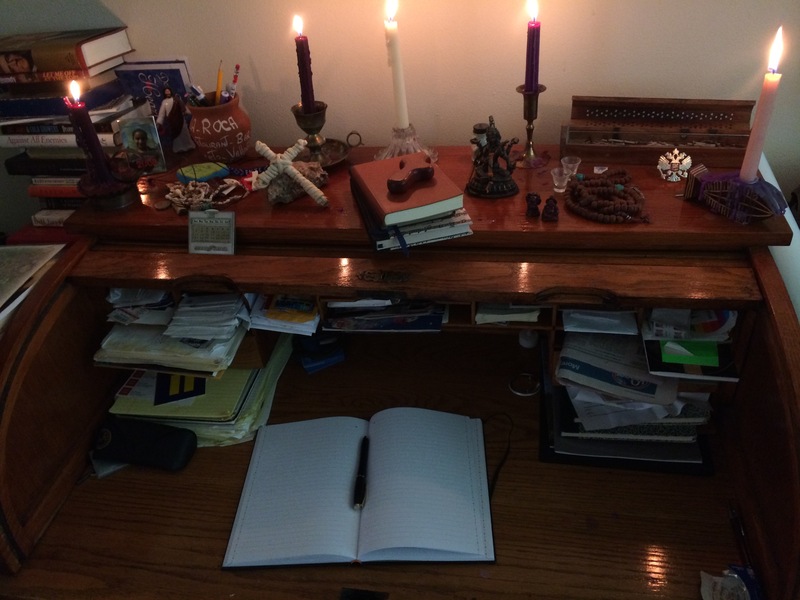 I think the feeling-better is cumulative….from both the ride…and the prayer/writing at this desk which is my centering place at home. Which reminded me of something that should be self-evident: We can go out. But we can (and should) also always go in too. When I take the time, this desk becomes a White Rock sunset for me. It calms and centers me the way a good bike ride does. But, just like going to the lake, we have to take the time to go “in.” And when we’re stressed, when we’re spinning as a fast as we can, the last thing we think we need to is to slow down, and go inward. When, in fact, it may be the very thing we need. And then, it dawned on me: That’s what WE do, as people. Way too often, we’re just like that dryer. We get stuck in the spin cycle and keep spinning until we self destruct. And yet, to do any of this….to ride around the lake….or to sit at the desk in the quiet…all these things require CHOICE. The choice to take and make the time. You deserve more than just life’s spin cycle.